This post is written by Courtney Denning, blogger at Cbus52. You can follow her on Twitter @CourtneyDenning. This is the first is a series of posts on gluten-free dining in Columbus. A Columbus native, Donato&apos;s motto is “To serve the best pizza and make your day a little better.” My day is always better if it includes Donatos’ gluten-free pizza. They have collaborated with Udi’s, a company that is well known for its gluten-free bread, to offer gluten-free pizzas in restaurants and take-and-bake pizzas for customers to prepare at home. This is the best gluten-free crust I have ever eaten! It’s thin, but stable, buttery and has the perfect crunchy and chewy texture. We like to get the take-and-bake pizzas so we can add our own ingredients at home. zpizza, a national chain, is the first place I ever tried gluten-free pizza and has been my go-to pizza place in Columbus for years! They have great pizza creations with unique flavor combinations. 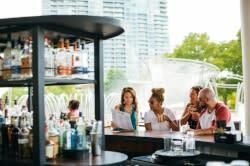 The company prides itself on offering lots of healthy menu items and organic ingredients. They also do a great job listing which toppings are gluten-free or vegan on their website. My favorite pizza is the Tuscan Mushroom with pineapple! 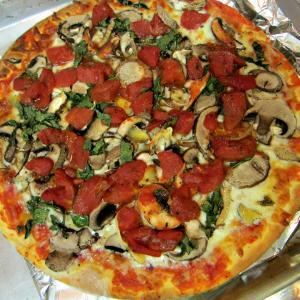 Yellow Brick Pizza has many clever pizza toppings for their thin crust gluten-free pizza. Like Zpizza, they also have creative signature pizzas with equally creative names. I have personally enjoyed the Mad Greek and Elliot Smith - both were fantastic. They also serve gluten-free hard cider. Pizza Rustica is another chain restaurant, but Columbus has the only two locations in Ohio. They have a wide variety of signature pizzas, which are loaded with great toppings. Their crust is thin and crispy, but sturdy enough to handle all those toppings! My favorite is the Rustica, which includes prosciutto, artichoke hearts, kalamata olives and mozzarella - delicious! This is just a handful of the gluten-free pizza options in Central Ohio. I recently asked members of an online gluten-free group what their favorite pizza was in Columbus and received an overwhelming response. In addition to my four favorites, twenty other pizza places were recommended to me! Looks like I have some taste testing to do!